Ask4 are a telecommunications services provider based in Sheffield. They provide services to over 400 businesses and they are also a leading provider of internet services for student accommodation. Ask4 approached Annurca in 2010 to carry out an all inclusive health and wellbeing programme for their members of staff. There was genuine concern amongst their directors that their staff were physically inactive, both in and out of the workplace, as well as having poor eating habits. 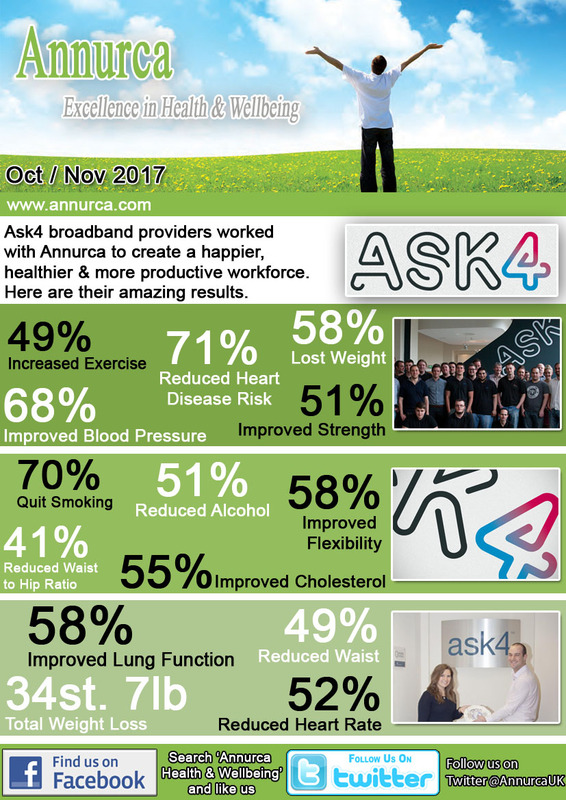 Working with Ask4 Annurca devised a programme which ensured that the health consultants got in front of the staff every 3 months ensuring that good health remained at the forefront of their employee`s minds. It was important to change employee`s mentality so making the right choices and good health became a way of life rather than a chore. Annual comprehensive and confidential health assessments were conducted producing benchmarked data. Interactive workshops, mini reassessments, one on one consultations and reviews have ensured that the employees remain on track. Contact Annurca now for a confidential chat on 0333 207 9663 or email us at enquiries@annurca.com to find out how you can keep your employees healthier, happier and at work!